Neonatal Jaundice Treatment - What Are The Options for My Baby? 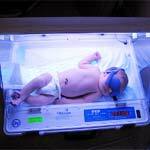 Neonatal Jaundice Treatment – What Are The Options for My Baby? Neonatal hyperbilirubinemia is a condition commonly seen in nearly 70% of all newborn babies. Neonatal jaundice is manifested trough higher than normal bilirubin levels in newborns, yellowing of the skin starting from the head and progressing downward to the feet. Yellowish color of the whites of the eyes is another very common symptom of the neonatal hyperbilirubinemia. Neonatal jaundice treatment is usually not necessary in otherwise healthy newborns since the condition resolves on its own by frequent bottle or breast feedings that help remove excessive levels of bilirubin from newborn’s liver. However, neonatal jaundice treatment is highly necessary for premature or underweight babies whose liver and digestive system overall are still immature to fully process high levels of bilirubin in blood. In case of a blood type incompatibility between the mother and the child, the mother gets an injection of RH immune globulin within 72 hours of birth to prevent her from producing antibodies which can destroy her baby’s red blood cells formation and higher than normal bilirubin levels in newborns. Bilirubin phototherapy is the most commonly prescribed neonatal jaundice treatment that utilizes special blue light to help baby excrete high levels of bilirubin from his body. A baby is placed under the lights unclothed with a dark eye mask to protect the eyes from the bright lights. Care should be taken to keep the baby well-hydrated with breast milk or formula to facilitate the removal of excessive bilirubin from baby’s blood through urine and stools. In rare cases of neonatal hyperbilirubinemia, a serious neonatal jaundice treatment is necessary and is carried out with the help of blood exchange transfusion to supply a newborn with fresh blood, if all the other treatments failed. Close monitoring of higher that normal bilirubin levels in newborns is crucial to avoid rare but potentially dangerous complications.